I have dehydrated skin and sometimes I feel it’s not the easiest to find products, lots for dry skin but not so much for dehydrated. So how do you know if you have dehydrated skin? Well it took a few facialists to tell me, but dehydrated skin is described as ‘the skin’s inability to retain its limited moisture in the epidermis’. In other words, your skin is not getting the moisture it needs and therefore it can look dull, not very plump and can result in deeper wrinkles, yikes! Dehydrated and dry often get mixed up, but dry skin lacks oil and dehydrated lacks moisture. The best thing I have learnt for dehydrated skin is to eat a healthy diet, make sure you get enough fish oils and eat things like walnuts for omega-3 fatty acids and I have also started taking cod liver oil tablets to see if that can help. I do suffer from very dry skin too in some parts and slight redness skin conditions in the colder months, whether that’s dermatitis or eczema I’m not sure, but something I’m going to get looked at very soon. 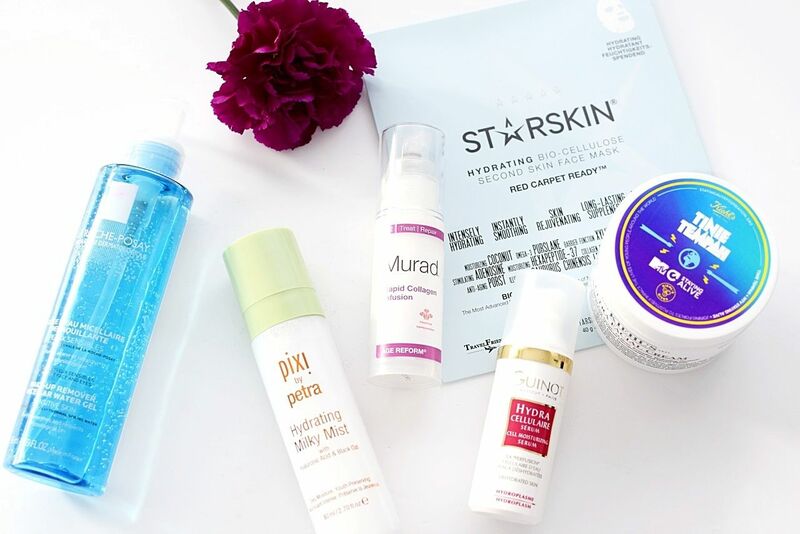 However it’s important to also use the correct skincare for dehydrated skin as using products not designed for your skin type could actually be making it worse. 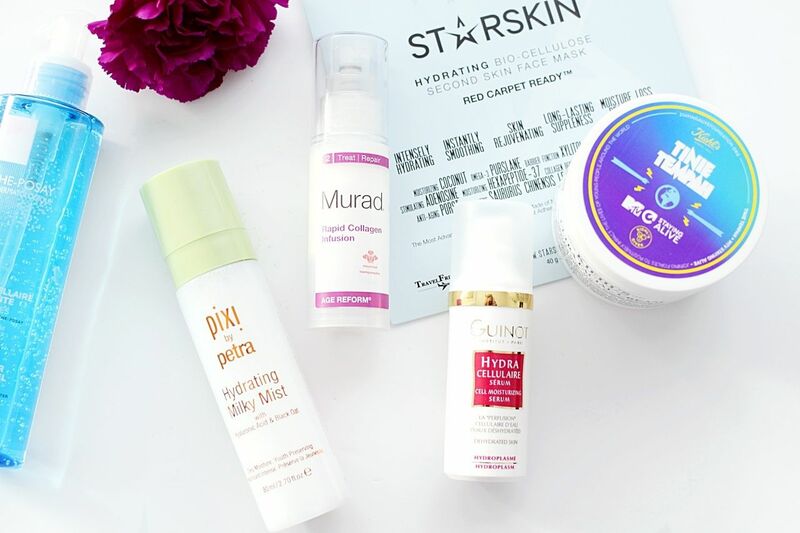 Here are six of the best products I would recommend for dehydrated skin. The Starskin hydrating sheet mask does exactly what it says, adds a boost of hydration to your skin. The mask is soaked in serum which has ingredients such as collagen restoring lysine, anti-aging porst, moisturizing coconut and omega-3 purslane. I like to put it on before I get in the bath and sit back and relax. The mask adheres onto your skin like a second skin and instantly it feels hydrated. Leave on for 20 minutes for a hydrated glowing new complexion. Starskin masks are £8.50 each, available at ASOS. One of Murad’s Step 2 treatment products,which if you didn’t know are amazing. These really focus on the problem at hand and in this case, dehydration. The Rapid Collagen Infusion is fast acting and boosts collagen and hydration levels. The collagen support complex boosts skins resilience and plumps dehydrated skin to reduce the appearance of wrinkles, which I mentioned can be more prominent. Murad have a limited edition bottle of the collagen infusion where £10 of the retail price will be donated to The Prince’s Trust. Designed especially for dehydrated skin, Guinot’s cell moisturising serum is a one month intensive treatment that provides in-depth hydration by bringing cells which do not have enough water back to life. The serum uses Hydroplasm, a complex developed from intensive research by Guinot. This powerful and protective active ingredient penetrates cellular walls for deep moisturising directly in the cells, providing long-lasting moisture to the skin. Apply morning and night before moisturiser and you should start to see results within a month. Pixi beauty are more known for their make-up range, but have recently launched a collection of skincare. The Pixi hydrating mist has hyaluronic acid and black oat to provide a surge of hydration to the skin. It has a cocktail of vitamins, B1, B2 and B6 as well as provitamin A to aid thirsty skin. It’s a light spray so can use before make-up, in the evening or just throughout the day when you need a hydration boost. Keep this on your desk at work and spray throughout the day, if you suffer from pesky air con! A firm favourite of mine, this moisturiser is so lightweight it’s ideal for during the day and also a lovely make-up base. It provides all day hydration, doesn’t have a fragrance and you don’t need too much either so the big jar will last you quite a long time. The cream has glycoprotein extracted from sea glaciers to protect against cold weather, whilst desert plant extract found in the Australian outback helps retain water in dry conditions. This month also saw Tinie Tempah team up with Kiehl’s to design his own Ultra Facial Cream packaging to help support the MTV Staying Alive Foundation. £2 from every sale goes to help prevent the transmission of HIV/AIDS. Another favourite, check out Kiehl’s Daily Reviving Concentrate. If your skin is dehydrated it’s maybe sensitive too. La Roche-Posay are great for sensitive skin and their micellar water gel, is a good one for make-up removal. I actually find putting too much actual water on my face can be really drying for my skin, so a micellar water that is also a gel is perfect. It feels comforting and gets rid of make-up fast. Apply to a cotton pad then wipe across the face, no need for water, easy! I also recommend a good scrub to get rid of dead skin cells and make sure the products are getting through to the skin. A few recommendations are 001 Pure Active Peel & Murad Skin Smoothing Polish. Have you got any tips for dehydrated skin? Check out my most recent post on dehydrated skin products and what to look out for.